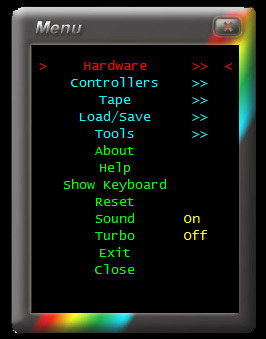 The menu button only works on a registered version of the emulator. Options include but are not limited to fast tape loading, joysticks, debugger, assembler, and more..
Hardware Model 48k | 128k | +2 | +3 Selecting the model will restart in the chosen model. Screen Type Monitor | CRT Monitor is the cleanest and fastest rendered image. Network Network | NONE Adds Network interface to connect Spectrums. Tape Fast Loading ON | OFF On will run the Spectrum and tape deck as fast as it can while the tape is loading, Skipping the internal time delays. Once you have selected a Mouse in the Controllers Menu you are in "Mouse Mode"
To control the PC Mouse press Escape, To open the menu press Escape again, If you no longer require the mouse disable it under the controllers menu. Using the navigation menu on the right please read the Help documentation before e-mailing questions on "HOW TO"
However if you are unable to find what you are looking for please use the contact page as there may be others with the same question and we can answer it here for future reference. Thanks for reading, please if you can help out do so - Enjoy ZXSpectrum4.net Team.